I recently had the opportunity to go back to Singapore, and was anxious to get a glimpse of the rebounding smooth-coated otter population (Lutra perspicillata). These beauties have been in the news there over the last few years – the last time I was in Singapore there had been no sightings of otters, and recent conservation and environmental efforts since then have brought them back. The smooth-coated otter is the largest otter species in Southeast Asia, and one of two species that can be found in Singapore (the other is the more difficult to spot small clawed otter, Aonyx cinereus ). 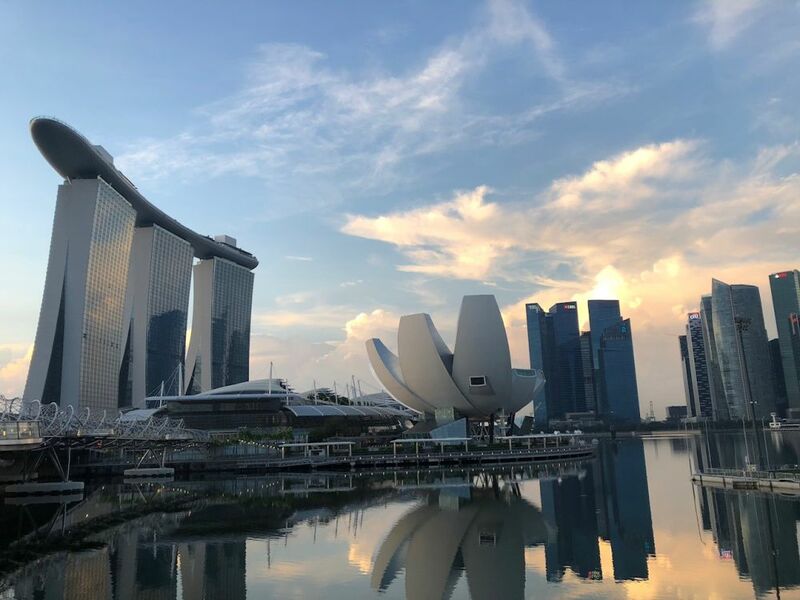 Much like the story of the resurgent North American river otter population in the San Francisco Bay Area, the smooth-coated otter species was completely absent from Singapore in the late 20th century. 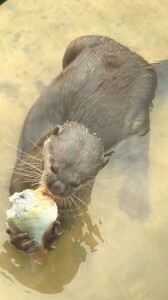 Due to Singapore’s rapid growth and industrialization at the time, waterways became polluted, and coastal areas that would otherwise be prime otter habitat were being built over. Not long after the turn to this century, efforts to clean up waterways and generally improve biodiversity took hold, and around 2014 the first otters were spotted in the local rivers, now clean and full of fish – perfect habitat for otters to thrive and raise pups. 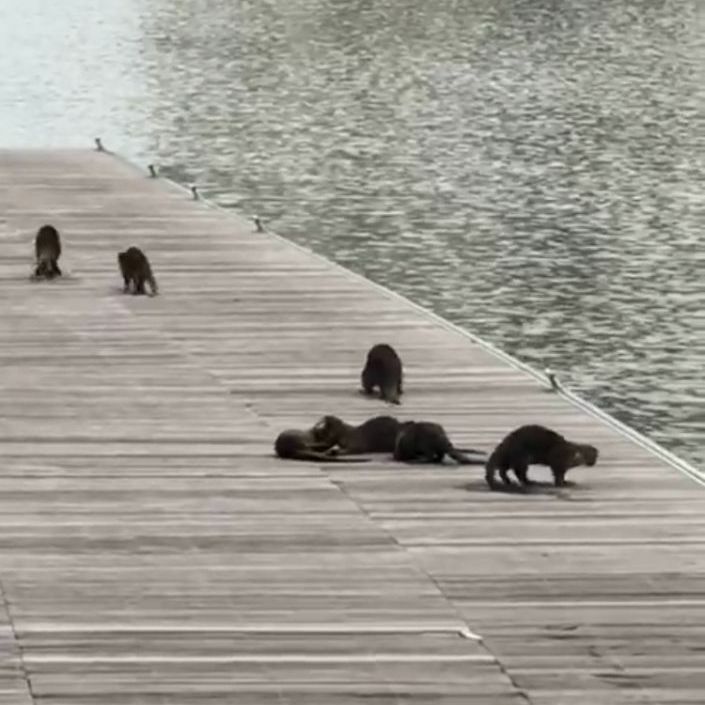 Before my trip I contacted a Singapore non-profit dedicated to monitoring the expanding otter population in this unique urban environment, OtterWatch, and they let me know some good spots near the Marina Bay area where it would be possible to spot the group known as the “Bishan otter family”. Singapore is an interesting place – a very modern and clean city enhanced by sections of equatorial jungle. While searching for the otters I was treated to many sightings of the Malayan water monitor lizard (Varanus salvator) – these critters can grow up to 8 feet or so and can have a profile in the water that looks remarkably like a river otter swimming. Also many fantastic birds – common kingfisher, black baza, white-bellied sea eagles, white-breasted waterhen, blue-crowned hanging parrot, long-tailed parakeet, Oriental pied hornbill, drongos, flycatchers, bubuls, and the ubiquitous Javan myna, all within a few miles of futuristic skyscrapers and elegant shopping malls. The OtterWatch folks had recommended a spot not far from downtown, along the Kallang River, and this is where I was lucky enough to spot a group of seven smooth-coated otters running along the riverside bank, swimming, tussling, and fishing. The otter population still is encountering some obstacles – illegal fishing and trapping has led to some otter fatalities, but the Singapore government is tightening enforcement against this behavior. These otters are fortunate to have so many people in Singapore enjoying the return of this wild critter , studying their behavior, and knowing that, as an indicator species, they’ve performed some of their environmental tasks correctly. 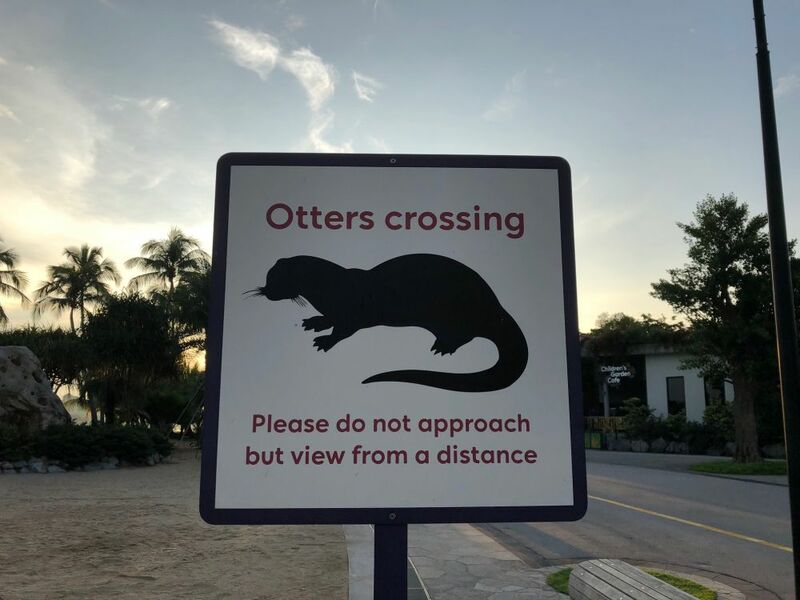 If you find yourself in Singapore and happen upon an otter, please record your mammal sighting here – it’s much appreciated.